Where did you intern this Spring and what were some of your favorite projects? I interned at the Newseum in the education, volunteer and visitor services department. Some of my favorite projects were working with the entire department as well as the curatorial department to create an activity cart for visitors based on media literacy. This cart engages visitors in various activities that can help them sift out good information from bad information in the media. Another one of my favorite projects was researching libraries in the DMV area for the Newseum education's department to partner with in order to give classes on identifying fake news. What did you learn in your classes? I learned a lot about interviewing tactics and ways to ease nerves when giving presentations and interviews in my one class. In my other class, I learned a lot about foreign policy and its many aspects. I had never taken a foreign policy class before, but taking it in DC made it worthwhile! In my free time, I visited museums and dove into DC's food culture! I have had Russian food, Korean BBQ, Vietnamese food, German food, authentic French food and so much different coffee and ice cream!! Where I am from in New York, there is not much diversity in food choices so I thrived in the DC food scene. I also thoroughly enjoyed the Cherry Blossom Festival and happy hours once I turned 21! Recommendations for future DC interns? My recommendations for future DC interns is to always keep an open mind and force yourself to step outside your comfort zone. I am very much a family and friend oriented person, so leaving them and coming to DC by myself was hard, but this has been the greatest learning experience of my life so far. If you just let yourself experience everything new around you with an open mind, you learn so much about yourself and other people. But also, don't take everything too seriously; let yourself have fun and take in your surroundings while you are here. Also, network while you can because there is no better place to do it! Four days a week for the last fifteen weeks, I have woken up and driven to work at NRA Headquarters in Fairfax, VA. It has been an absolute honor and a privilege to intern in the Grassroots Division of the NRA-ILA. The ILA stands for the Institute for Legislative Action, which is the political arm of the NRA, and what makes the NRA most famous. The NRA has always been my dream organization, even before I set my sights on a Political Science major. I am grateful that the Washington Internship Institute helped me find my way here. At my internship, I work directly with our Grassroots staff. One of our main goals is to mobilize gun-friendly voters and encourage them to get involved. Some of the tasks I was responsible for included coordinating volunteer efforts for local gun shows and interacting with people at various political conferences, like CPAC and LibertyCon. Additionally, I was also responsible for conducting my own research and presenting to Grassroots Coordinators on many issues within the current gun control debate so I was properly familiarized with the subject when I did have the opportunity to interact with people outside the office. My favorite part of my internship was attending CPAC with my colleagues. 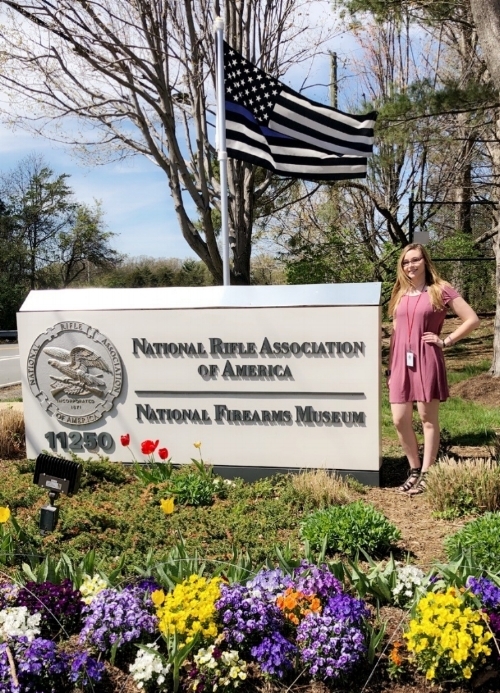 I am very interested in pursuing opportunities within either campaigning or grassroots efforts by a political organization, so it was a great opportunity to experience these interactions at a booth representing the NRA-ILA. When I wasn’t working, I had the opportunity to attend the various seminars and listen to different political speakers at the conference. I watched so many speakers live at the event, including President Donald J. Trump, Vice President Mike Pence, NRA Executive Vice President Wayne LaPierre, NRA Spokeswoman Dana Loesch, RNC Chairwoman Ronna McDaniel, TPUSA Founder Charlie Kirk, and many more. I also had the privilege to actually meet and take photos with TPUSA Communications Director Candace Owens, Sheriff David Clarke, and Editor-in-Chief of The Daily Wire Ben Shapiro. On Tuesdays, I had to take two courses at the Washington Internship Institute. In the morning, I had Internship Seminar, where I learned a lot of helpful professional skills such as interviewing and elevator pitches. I never thought the elevator pitch would actually be helpful, until I was in the elevator at my internship and literally ran into NRA-ILA Executive Director Chris Cox. In the afternoon, I chose the elective Inside Washington: Policy and Politics, where I had the opportunity to read about a topic each week and then debate with my fellow classmates. The coolest part about this course was that every week, we would also go see a speaker on the topic that is an expert in that field. We heard from professionals at the National Right to Life Committee, The Heritage Foundation, and an attorney that actually has prosecuted in cases where the death penalty was on the table. I also had the distinct privilege to invite one of my own supervisors to speak on behalf of the NRA when we were discussing gun control. In my free time, I would explore Washington, DC with my fellow classmates. I visited so many amazing places, including Arlington National Cemetery, the Capitol Building, and the United States Holocaust Memorial Museum. Overall, my favorite attraction had to be the Newseum, which focuses on reporters and how they exercised their First Amendment rights during hardships and tragedies around the world. I also am a huge sports fanatic, so I was sure to attend a Washington Capitals hockey game and a couple Washington Nationals baseball games. All in all, I truly had the time of my life interning in the Washington, DC area, and I owe this to the Washington Internship Institute. This city has so much offer that cannot be rivaled anywhere else in the world. Not only will this experience be pivotal in my professional career, but I have also developed friendships that will last throughout the rest of my personal lifetime. The people both in my program and at my workplace were some of the kindest and most passionate people I have ever met and they made my transition to life in Washington so much easier for me. My biggest piece of advice to future interns is to step out of your comfort zone. I am typically very timid, but I really allowed myself to keep an open-mind and experience everything I possibly could, even if I was sometimes uncomfortable at first. I honestly made the absolute most of my time in this city, and I hope that you will fall just as much in love with it as I did. The mission of the Washington Internship Institute is to foster students' intellectual, personal, and professional development through individually tailored, quality internships and challenging academic coursework that take full advantage of the opportunities available in the nation's capital and reflect the best practices of experiential learning and liberal education.